Water filters Perth | Total Aqua > Blog > Spring, Filtered, Purified or Distilled? Comments Off on Spring, Filtered, Purified or Distilled? Spring, Filtered, Purified or Distilled? What’s the difference between spring, filtered, purified, and distilled water? These days, something as simple as water has many different options. Of course, you have tap water. But what do you do if you’re worried about the health risks of drinking water straight out of the tap? Spring water often comes from an underground source and may or may not have been treated or purified. Purified water has been put through one of several processes, including distillation, deionization, reverse osmosis and carbon filtration. These processes help to remove chemicals and contaminants. Distilled water is a type of purified water that has been boiled into steam and condensed back into liquid. This removes impurities. Filtered water: filtering your tap water is the easiest, cheapest and safest way to remove contaminants. Bottled spring water – is it a good option? The short answer is no. Buying bottled spring water is expensive, and all those plastic bottles are bad for the environment. Although spring water sounds like it comes from a beautiful pool of water in the middle of the rain forest, the truth is that it is sourced from underground basins or wells. On top of this, spring water may or may not have been treated or purified before it is bottled and sold. Really, the only positive thing about bottled spring water is that it is convenient and easily portable. Purified water – what is it? 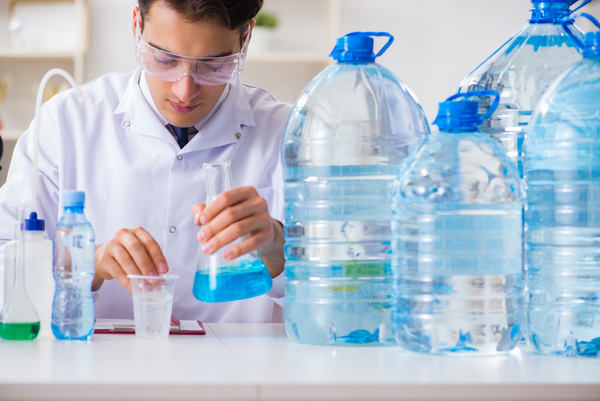 Water that has been purified goes through one of many processes to remove chemicals and contaminants. The problem with purifying water is that while it removes nasty things from water, it also removes the good things like minerals that are beneficial to the human body. Distilled Water – another type of purified water? Distilled water is a type of purified water that has also had contaminants as well as beneficial minerals stripped out of it. Therefore, distilled (or purified) water is the best option for human consumption, and you’re better off using it in your steam iron to avoid mineral build-up. Why is filtered water the best choice? Total Aqua believe that filtered water is the best choice for you and your family. Filtering your tap water is the easiest, safest and cheapest long-term solution to making sure your water is healthy. We believe that good health begins with good water, and we offer our clients a wide range of water filtration systems that can easily be installed in your home. From something as simple as a counter top filtration system to a whole house filtration solution Total Aqua can help. Contact Total Aqua today and say goodbye to all those confusing water options – with a filtered water system you won’t have to worry about the difference between purified water and distilled water any longer. We’re here to provide ongoing support and service – be it choosing the perfect product, installing your water filtration system or having our service technician conduct a product service. Choose your local Perth water filtration experts!